Handel's oratorio, Rinaldo (1711), is set in 1099 during the Crusades. The title character, a war hero, reminds Goffredo, captain of the Christian army, that he is promised to Almirena, Goffredo's daughter. The captain urges Rinaldo to wait for the war to end before pursuing Almirena, and he agrees. 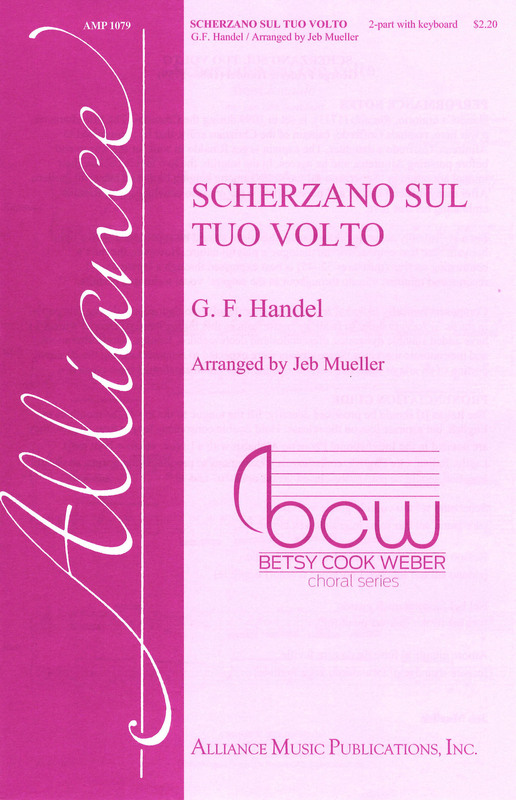 In the interim, the two lovers declare their mutual adoration in “Scherzano sul tuo volto” among singing birds and beautiful gardens. After many difficult battles and personal trials, the oratorio concludes with Rinaldo embracing his true love. For a stylistically accurate performance, this piece should be approached with a light, buoyant tone that emphasizes the dialogue's playful nature. However, the duet's contrasting section (measures 32-45) is best expressed through a legato tone. I recommend minimal vibrato throughout as the singers' vocal technique permits. Composers typically included few performance details into their scores during this period in music history; in order to facilitate performances that mimic those of Handel's time, I have added suitable dynamics, crescendos and decrescendos, tenutos, tempo alterations, and metronomic markings. Since singers were expected to ornament during the da capo portion of an aria or duet, this edition also includes ornamentations I have created.